The Buick Enclave's initial debut was in 2008, as the first-generation of the premium make's three-row crossover. That generation won accolades for its roomy interior and quiet, well-heeled ride quality. For 2018, Buick redesigned the Enclave, but paid close attention to what made the crossover so popular. The new 2018 Buick Enclave is smarter, stronger and more efficient. It retains its excellent interior quality, fine ride dynamic, and comfortable mentality. The 2018 Enclave is a bit larger than its predecessor, with added room for both second- and third-row passengers. The 2018 Buick Enclave is offered in four trim levels, all using the same engine and transmission. All but the base model have all-wheel drive as an option and all Enclave models include three rows of seating. The 2018 Enclave is definitely a looker. For this new redesign, Buick chose to make the changes contemporary, with an eye more toward class and ambiance than muscle and luxury. The cascading Buick grille is still there, but far more understated and now bisected by a sloping chrome line near its top. The front fascia of the new Enclave has narrow headlamps, a wide but not pronounced bumper and a simple intake below. Fog lamp bezels are larger, nearing the size of the headlamps above, to reduce the bumper's bulk. The hood of the new 2018 Buick Enclave is lifted at either edge to give a sporty bulge, while straight lines run along its center in triplicate, giving an air of movement across the hood. A raked windscreen flows into the slightly rounded roof to continue that aerodynamic forward movement. Side panels on the 2018 Enclave are simpler, with less adornment and more emphasis on classically sleek smoothed contours. The expected Buick tradition of a chromed lower runningboard line remains, as do the fender hashes. The beltline lifts a bit at the rear door and into the rear quarter panel, creating a Euro-swish at the rear pillar and pinching the greenhouse to give a more dramatic effect to the roofline and rear fenders. A body cut in the rear pillar gives a floating roof impression. The Euro-swoosh of the rear pillar is further emphasized by a matching line along the rear hatch and lighting, coming down to a de-emphasized rear bumper and simplified hatch and rear design. It's a great look overall that gives a lot of class to the 2018 Buick Enclave without dumping style in the process. This being a Buick, of course the Enclave has an upscale, luxurious appeal. The Enclave's interior design is well-done, with smart appointments and well-chosen materials. The simple luxury of the cabin is in line with Buick's wont, leaving ostentation for its sibling Cadillac brand. The driver and front passenger are treated to excellent seats with plenty of room all the way around. Driver's controls are well laid out and easy to access, while entry and egress are aided by wide-opening doors. Storage is also very good, with handy placement points for gadgets, beverages and more. In the second row, roominess remains the order of the day with a good amount of space between captain's chairs for stowage and adjustment. Behind those, the third row is larger than most in this category and can accommodate adults, though the big and tall may be a bit cramped. 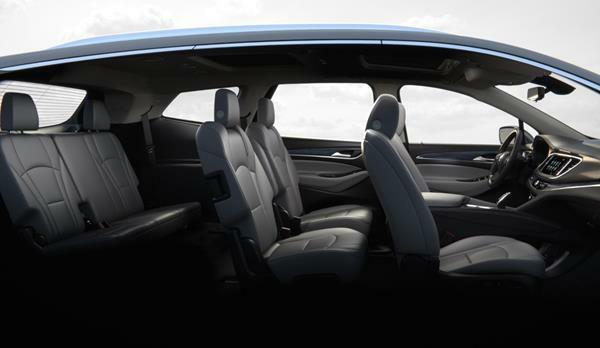 New this year is the ability to tilt the middle row seats forward (individually) to allow easier access to the third row from the wide-swinging rear doors of the 2018 Enclave. This tilt can be done even with a child safety seat installed (forward or rear-facing). Throughout the cabin, luxury appointments and nicely done upholstery are found. Plugs for devices are also plentiful, especially in the upper trims with their added technology upgrades. 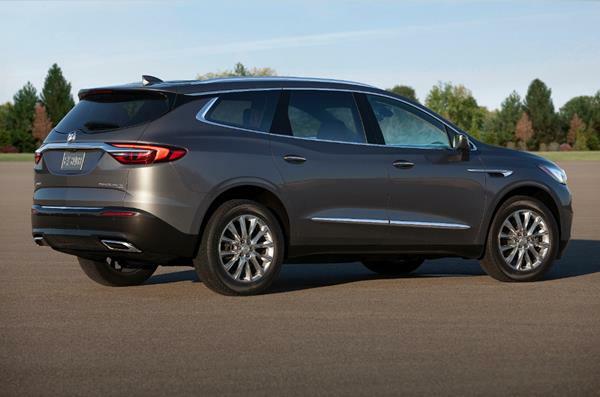 Standard comfort features in the 2018 Buick Enclave include tri-zone climate control, remote starting, a review camera and parking sensors, and basic infotainment. Several optional features are available, including wireless phone charging, upgraded audio and driver convenience aids. Advanced safety options are also available for the Enclave. The 2018 Enclave benefits from the latest infotainment from General Motors. An 8-inch touchscreen is standard equipment this year and includes Android Auto and Apple CarPlay, Bluetooth and OnStar 4G LTE Wi-Fi hotspot. Upgrades can include navigation and other options for the infotainment system. Infotainment in the Enclave is well done and easy to use, but does lack some of the apps found on other competing systems. Occasional slow-downs to response times can happen, especially when WiFi is in use. However, most people will likely be happy with the overall technology experience in the 2018 Enclave. Fuel economy in the 2018 Buick Enclave is EPA-rated at 18 mpg in the city and 26 mpg on the highway in its front-wheel drive models. All-wheel drive lose a point in both city and highway mileage. Both of these numbers are close to real-world expectations. Our week with an AWD model showed it getting very near the EPA's estimates at about 23 mpg overall. We expect most users will get close to or exceed the EPA estimates for the 2018 Enclave in most normal driving conditions. The Buick brand as a whole has an about average reliability expectation. The 2018 Enclave being all-new, we have little to go on for reliability estimates for this specific model. The J.D. Power and Associates Vehicle Dependability Study, as of this writing, has not yet been published to include the 2018 Enclave. We note that there have been no major recalls related to the 2018 Encore and that Buick's warranty for the crossover is in line with the industry average at four years or 50,000 miles and six years or 70,000 miles for bumper-to-bumper and powertrain, respectively. The 2018 Buick Enclave has received a 5-star overall rating from the National Highway Traffic Safety Administration, with four stars each for frontal crash and rollover ratings and five stars for side crash ratings. The NHTSA scores for the Enclave are very good. The Insurance Institute for Highway Safety, as of this writing, has not yet published crash results for the 2018 Enclave. Although mechanically not identical, the previous-generation Enclave received top scores from the IIHS and we expect that to continue. Knowing that the Enclave is not a sports-oriented vehicle, it's easier to assess its relative performance compared to its contemporaries. The 3.6-liter V6 that powers the 2018 Enclave is a new-generation engine that outputs a respectable 310 horsepower to a nine-speed automatic transmission. Both front-wheel and all-wheel drive are available, depending on trim level. The Enclave's engine is sized right for the crossover and offers a good amount of acceleration when needed. It is otherwise unobtrusive, doing its job when asked and staying quietly in the background when not called upon to do anything outside of ordinary driving. Likewise, the new transmission in the 2018 Enclave delivers smooth shifting and unobtrusive changes during most driving. It jumps into the fore only when called on for downshifts or other fast-acceleration requirements. Handling in the 2018 Buick Enclave is nicely done, with a good balance between road feel and comfort. 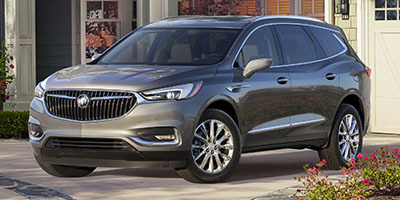 The Enclave, as with most Buick models, has a very quiet cabin at any speed and smooths road imperfections with ease. 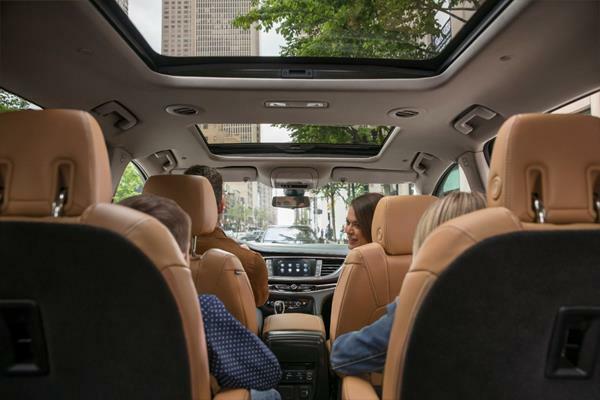 Maneuvering the Enclave is easy thanks to the larger-than-expected windows and excellent visibility the crossover offers. Driver aids such as the 360-degree camera are a nice addition as well. 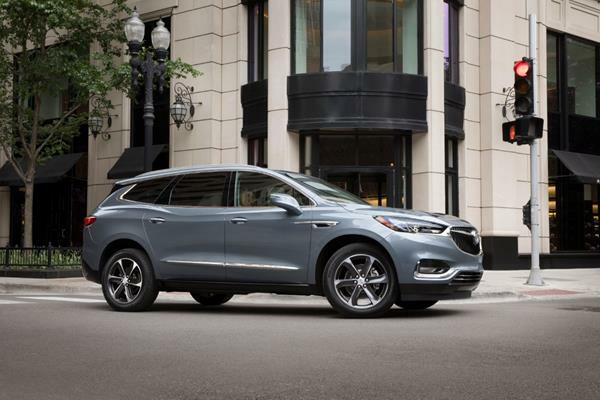 The value found in the 2018 Buick Enclave will largely be in the lower-than-luxury price paid for the upscale Enclave versus the non-luxury makes. Sales for the Enclave improved dramatically when the new 2018 models were introduced and pricing of the top-level Enclave Avenir is at parity with the highest-priced non-premium vehicles on the market, which likely means more bang for the buck with the Buick. Most buyers will be in the $45,000 range in their 2018 Enclave purchase. Those willing to pay two or three thousand more might get a top-level Enclave without buying into a more well-heeled luxury marque, while receiving much of the same level of refinement. 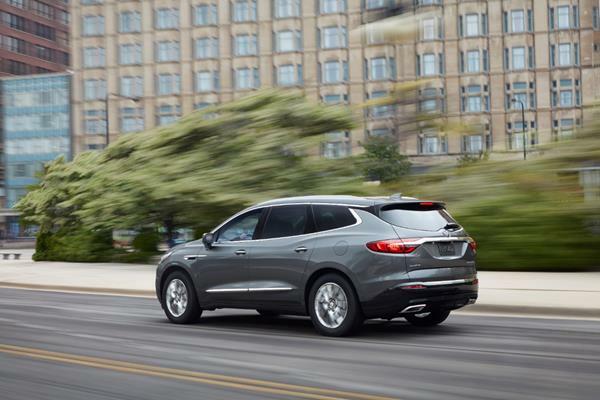 The 2018 Buick Enclave is difficult to compare to other makes, as Buick is one of the few premium-level marques whose price and accouterments fall just below the luxury-level makes, but sit well above the standard offerings in any given segment. GM leaves true luxury to the Cadillac brand and standard-level fare to Chevrolet. Most luxury makers compete with Buick at the lower end in their entry-level models, but are otherwise over and above. With that being said, the Volkswagen Atlas newcomer could potentially take some market share from the Enclave, especially in the VW's higher-end trim levels. The Acura MDX is also a potential contender against the Buick, though the MDX trends towards more sport in its drive and less comfort in its ride quality. The mechanically-similar Chevrolet Traverse is also a potential competitor for the Buick model. All told, the 2018 Buick Enclave is still a great vehicle and one of the best midsize three-row crossovers we've driven thus far. Improvements in this redesign are plentiful, and the overall presence and appeal of the Enclave is clear. Interested to see how the 2018 Buick Enclave ranks against similar cars in terms of key attributes? 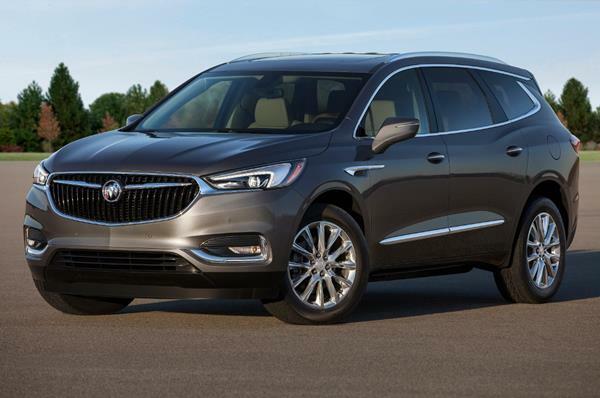 Here are the 2018 Buick Enclave rankings for MPG, horsepower, torque, leg room, head room, shoulder room, hip room and so forth.